A mother-daughter bond can be a powerful thing. Honor it with coordinated or matching ink that inscribes your affection and appreciation for each other on your skin. 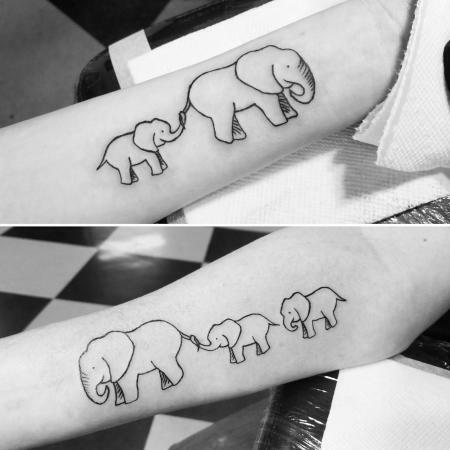 For Mother's Day, or any day, a trip to the tattoo parlor together advertises your forever link to the rest of the world. 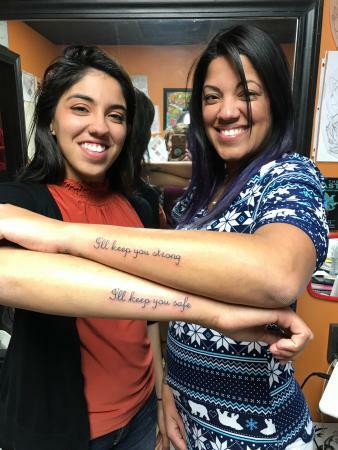 Popular mom-daughter tats are often quotes borrowed from favorite read-aloud books, treasured songs, or heartfelt sentiments. Mirror a single line of words or split a couplet that sums up what you mean to each other. You are my sunshine on the college student's arm is completed by My only sunshine on mom's arm in these matching tattoos. It might just make you want to break out in song - even more if the words are scrolled around two halves of a bright sunflower that match and meet up when mom and progeny place their feet or forearms side by side. A tattoo that attests to some tough times weathered together celebrates struggle and survival. A pink ribbon (the breast cancer symbol) that ties together a pair of boxing gloves says it all. On the mom's tat, the single word: Survivor. 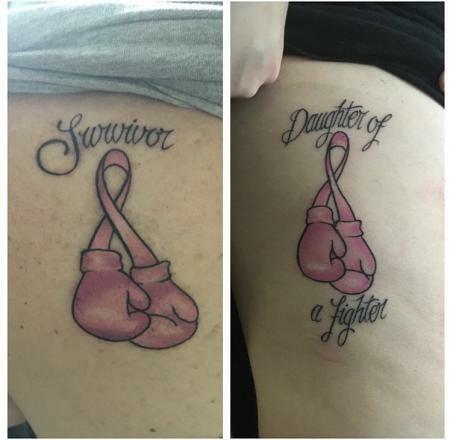 On the daughter, the proud: Daughter of a Fighter. Together, the two of you are a force to be reckoned with. A neat infinity shape formed of the words I love you to the moon and back is a reminder of the beloved children's book Guess How Much I Love You is featured in this mother-daughter design. You can go small with words gathered into a compact figure 8 - ink the twisting words on an inner wrist, the back of the neck, the top of the foot - but keep the letters large enough to be legible. This one probably won't fit on your finger. Really direct and simple messages can fit on the outer edges of arms or encircle ankles: I'll keep you strong and I'll keep you safe look good in a clear open script and are promises worth making. If you and your mom share a sense of humor, have some fun with your tats. Celebrate a simple tradition, an activity you both enjoy, or a lifelong delight in two of everything. Tell your story in pictures. A stick figure mommy in a triangle dress and the same cartoon character, but smaller with different hair, stay in touch -- ankle-to-ankle or wrist-to-wrist - when each is holding up a tin can with a string stretched out from it. You'll have to negotiate who is talking and who is listening. Arrange the ink so the strings connect when you are standing next to each other. Lucky ladybugs symbolize your good fortune in being both family and friends. Get them in full color and on the same part of the body like the collarbone, behind the ear, just under the ankle, or inside the wrist. The ladybugs can be the same size or the daughter's can be slightly smaller than the mother's. Tracing the ladybugs' movements in the infinity symbol shape underscores the endless nature of your bond. Art hearts are a single watercolor abstract image, but the larger tattoo is the perfect, empty outline of a heart in black pen-like strokes surrounded by smears and splashes of translucent rainbow colors. This might take up an entire inner arm, a lower leg, the back of a hand, or a shoulder. The "matching" tat is just the cut-out heart, its black outline visible and its interior filled-in with more of the translucent watercolors. The cut-out heart should be in a similarly visible body location - generally, the daughter will claim the cut-out piece. The isolated heart belongs in the big picture which is missing the heart at its center when the two images are separated. Shared magic: a mother and daughter swinging on the crescent moon. Remember those days of pushing or being pushed high into the sky, loving it and laughing? Invoke that fun again, and always, with mirror tats of each of you on swings, suspended in the moonlight. 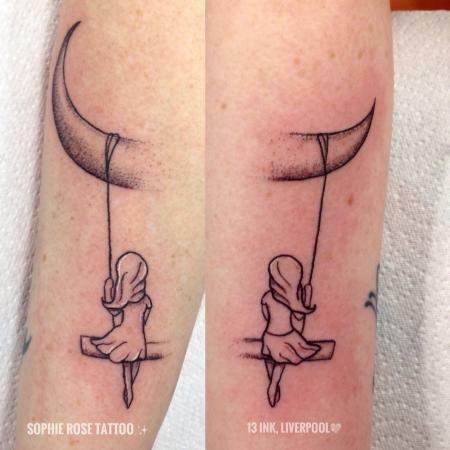 This is the perfect vertical ink for an arm. You share the same spirit in two different but connected forms. That's just the way it is with moms and daughters who are close - you mean a lot to each other and your mutual tattoos are all about the meaning. A lucky sentiment is an image of elephants with their trunks entwined. Elephants are strongly bonded creatures: very nurturing mothers and very attached calves. Sound like anyone you know? Two elephants can sit happily trunk-to-trunk on shoulders, over the shoulder blade, on the lower back of the calf, or on top of the foot. A mama elephant leads a baby (or two) with its trunk entwined in her tail. The connected family wanders across feet, up forearms, or from one side of the upper back to another. Heart it. Tiny blue forget-me-knots, inked like rings on top of a finger, show that you'll never stray far from each other's thoughts. Symbolic in many cultures and gorgeous in all are butterflies, making them a great matching tattoo option. Get one half of a vivid monarch on the top of your hand, just at the outside edge. 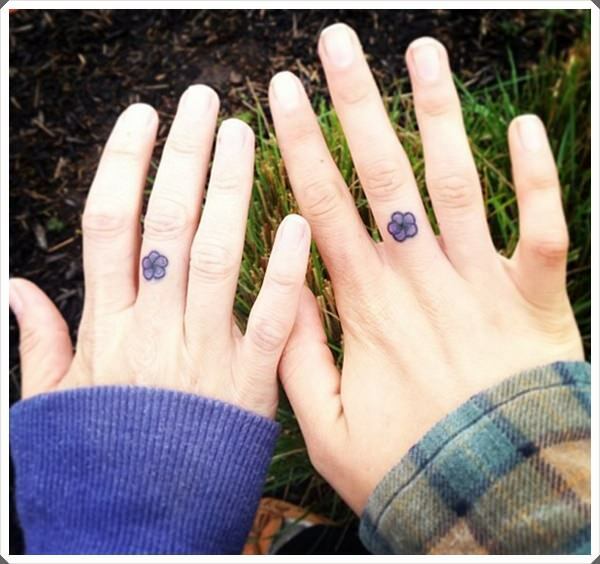 Have your mini-me ink the matching half-monarch on her hand. Now put your hands together for the whole breathtaking story - life is continuously unfolding through every adventurous stage. Wing it together. Two halves make a whole when you share a yin yang symbol as well. Stick with two halves of the plain black/white (or black/clear) symbol or decorate them with a delicate mandala design or each other's names. On the top of your feet, it's easy to place them side-by-side. Hands and forearms allow similar match-ups. But you could also do left-right upper backs or very dainty yin yang halves outlined on the inner wrists. Mother-daughter tattoos are absolutely unapologetic declarations that the two of you are lifelong fans and don't mind who knows it. They work for the coming-of-age and aging alike. The events of life may separate you but nothing can ever sever that connection. Your ink is a daily reminder of who loves you and who owns a piece of your heart. What better reason to get a tattoo - or two of them?